Ever since Sabine and I accompanied Jenny Lippert to Little Pigeon Prairie in early July (see The Search for Sisyrinchium sarmentosum), I had been wanting to get back there to explore the main wetland at Pigeon Prairie, which we didn’t have time for that day. It had been five years since I’d been there and seen an amazing show of king’s gentian (Gentiana sceptrum). I also wanted to check on the seeds of the blue-eyed grass we had seen, in case that would help with deciding if it was the rare Sisyrinchium sarmentosum or the common S. idahoense. It’s a long drive for me to get there—just south of Detroit—but since the heat has been sapping my energy, I didn’t want to do anything that required any climbing, so a flat wetland seemed like a good idea, and I headed up there last week on July 30. 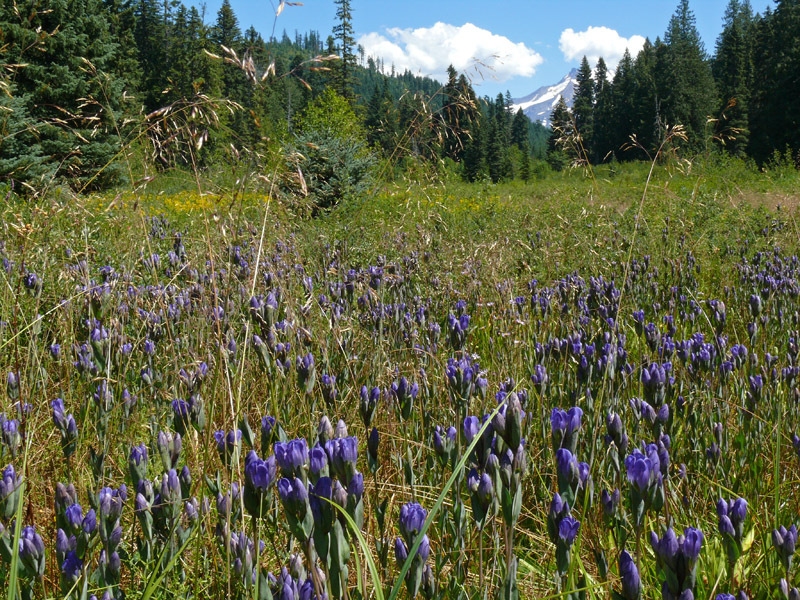 King’s gentians cover the drier edges of the wetland at Pigeon Prairie, not too far west of Mount Jefferson. As it turned out, I had to do quite a bit of bushwhacking—there are no trails in this area—and walking around a wetland of tall sedges and standing water can be tricky, so it wasn’t as relaxing as I’d hoped. But I’m so glad I made the trip. When I arrived at Little Pigeon Prairie, which is only a thin strip of trees away from Road 620 (off of McCoy Road 2233), I was almost immediately greeted by the tall purply-blue wands of Gentiana sceptrum in perfect bloom. Sometimes I feel as though I spend so much time exploring new spots or looking for rarities or particular plants I’m studying or need to photograph that I miss out on the big shows of wildflowers that most people are seeking out. I could have gone to some alpine meadow at peak bloom, but here I was going to a fairly low elevation (3600′), sedge-covered, boggy area well past “peak” season. But even if the gentians were the only flowers left in bloom, it still would have been worth it, as there are few plants as glorious as a large-flowered gentian, and meadows full of this regal species are as spectacular as anything else I could have imagined seeing that day in the Cascades. 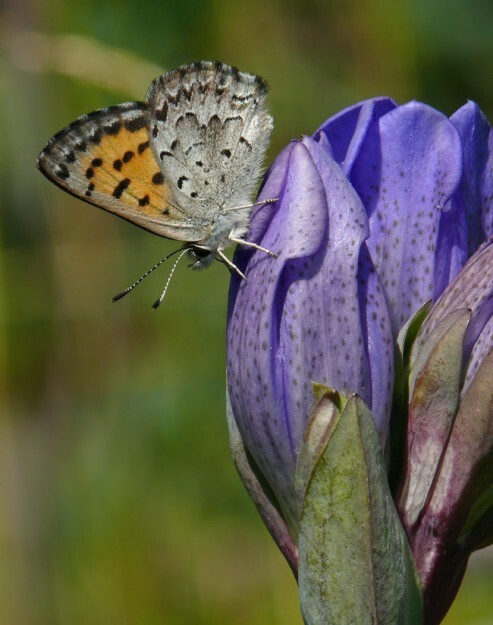 A mariposa copper finds something of interest on the outside of the flower of king’s gentian (Gentiana sceptrum). After photographing lots (and lots!) of gentians, collecting some Sisyrinchium seeds, and noting a welcome addition to my plant list—the low-growing, single-flowered alpine aster (Oreostemma alpigenum), I drove a short ways farther down the road to the old logging road Jenny had taken us on. I quickly reached the meadow we had spent so much time in on the last visit. While that time it was mostly decked in yellow from arrowleaf groundsel (Senecio triangularis) and streambank butterweed (Packera pseudaurea), this time it was blue with gentians, along with pink highlights of clustered roses (Rosa pisocarpa). Hooded ladies’ tresses (Spiranthes romanzoffiana) were coming into bloom everywhere. There were a number of butterflies here, including a lorquin’s admiral, Boisduval’s blues, and orange sulphurs that kept teasing me by landing on western asters (Symphyotrichum spathulatum, formerly Aster occidentalis) only long enough to point my camera at them before they fluttered on to the next one. As at Little Pigeon Prairie, there were quite a few mariposa coppers. Their host food plant is huckleberries, of which there were a number of species here, including Vaccinium cespitosum, V. uliginosum, V. ovalifolium, and V. scoparium. On my way back through the meadow, I was very excited to see another buckeye—the second or maybe even third time (including a possible sighting at Potter Mountain the week before) I’ve seen them this year after never seeing them in Oregon for over 20 years (A Glorious Day Near Lopez Lake). 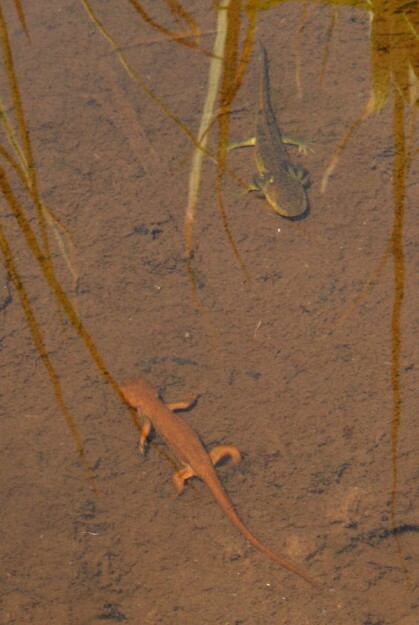 A rough-skinned newt crosses paths with another salamander in the shallow water of the creek. On my two previous trips to the main Pigeon Prairie, I had approached it from the north via a gated off gravel road and a bushwhack downhill through some woods. This time I wanted get there from this meadow, so with the wetland to the northeast of me, I headed over to the wet corner of the meadow. As I was about to enter the woods, I discovered two interesting additions to my plant list for the area. The first was Sitka clubmoss (Lycopodium sitchense), a refined cousin of the much coarser and more common ground-pine (Lycopodium clavatum), which was also in the area and as abundant in the woods here as I’ve ever seen it. While I most commonly see Sitka clubmoss near the Cascade crest, I thought it grew only at higher elevations, but I guess it was especially cool in this spot because the other plant I discovered nearby was also a high elevation species, one that I never would have guessed could grow this low—yellow mountain-heather (Phyllodoce glanduliflora). At first I thought it might be the more common pink mountain-heather (P. empetriformis), but the needle-like leaves were wrong somehow. The clincher was glands evident on the sepals—those of pink mountain-heather are glabrous. Of course, it would have been easy as pie to ID this plant had I seen it a month ago when it was probably still in bloom. Wait—I was here a month ago! Damn, I was so close. If only I had wandered over just a little farther on the last trip. It makes you wonder how many interesting things you miss just out of sight. 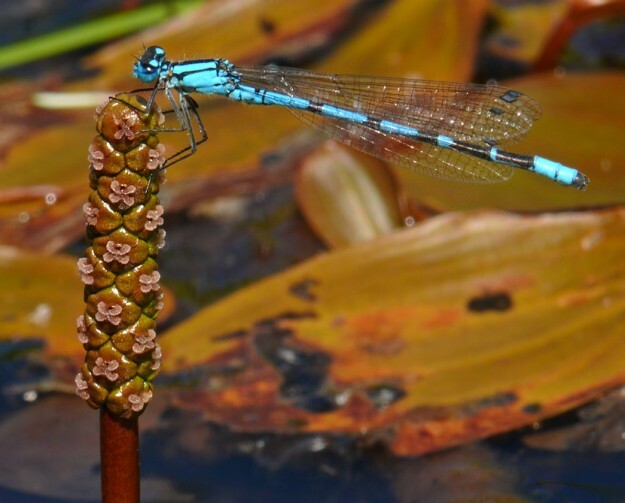 The odd-looking inflorescence of floating-leaf pondweed (Potamogeton natans) makes a good lookout for a damselfly. 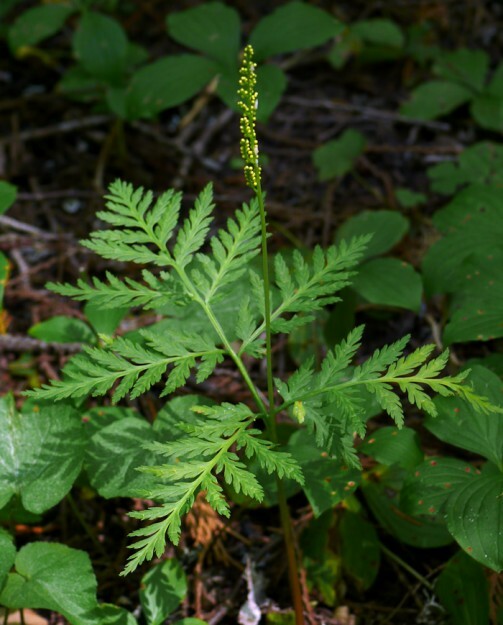 At first glance, Virginia grape fern (Botrypus virginianus) looks very much like a regular forest fern, but like other grape ferns, its fertile part, called a sporophore, is attached to a single sterile, frond-like leaf called a tropophore. From there, I pushed my way through some shrubs into the fairly open woods. Walking was reasonably easy in here, although I had to climb over many large logs. It was fairly damp—not surprising so close to a bog—and there were many interesting plants along the way, including several shade- and moisture-loving graminoids such as smooth-stemmed sedge (Carex laeviculmis), nodding semaphoregrass (Pleuropogon refractus), and tall mannagrass (Glyceria elata). These are some of my favorite grasses and sedges, not just because they are attractive, but because I can actually identify them now! As I continued through the woods, checking my aerial photo and GPS to make sure my sense of direction was correct, I came across another surprise—a very small population of Virginia grape fern (now Botrypus virginianus). There were quite a few of the relatively common leathery grape fern (Sceptridium [Botrychium] multifidum) in the meadows here, but I’ve only seen this species in 3 other locations, and any grape fern is cool in my book. There were only 6 plants total in two different damp depressions. Perhaps there were more scattered throughout the woods. It would take some time to survey the whole area. Instead I popped out into the wetland. I wasn’t as far west as I’d expected, but I still recognized where I was—in another spread of gentians! These were set off beautifully by a bright yellow patch of goldenrod (Solidago sp.—canadensis has been split, so I don’t know what to call them anymore!) and equally bright pink Douglas’ spiraea (Spiraea douglasii). 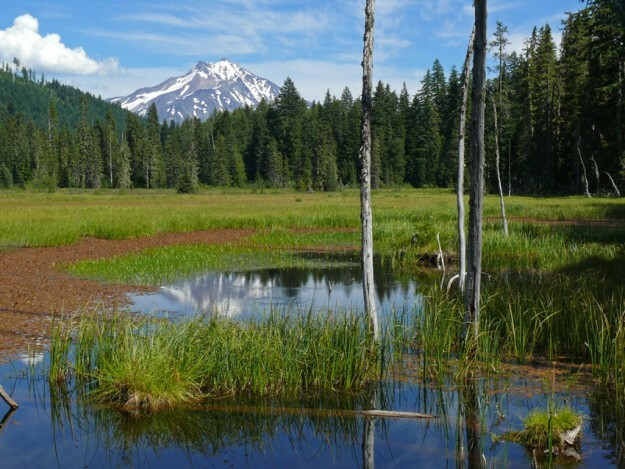 On top of that, Mount Jefferson suddenly appeared, looming over the meadow. I tried in vain to get a photograph that would capture the mountain and all the wildflowers, but I guess I was just being too greedy and had to settle for just a couple of these showstoppers in each photo. There’s a great view of Mount Jefferson from the beaver dam that formed the pond. The brown layer on the water surface on the left is a mass of floating-leaf pondweed, while the green just to the right of it is bur-reed. Bur-reeds have the cutest little pom-pom-like inflorescences. The male flower is on the top with the burst of stamens that reminds me of fireworks. The female ones have conspicuous ovaries topped with a fuzzy stigma. 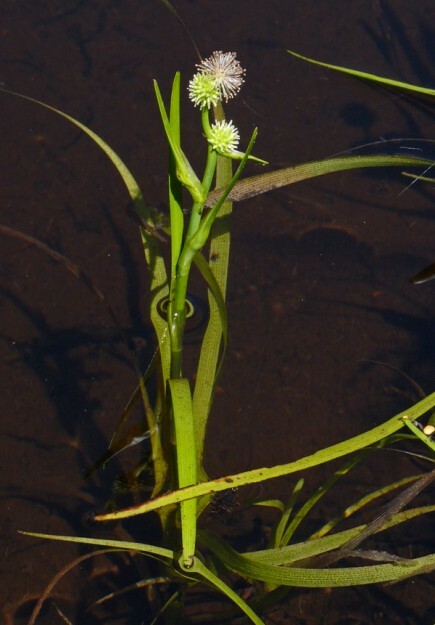 Small bur-reed has few flower heads and has short leaves up near the inflorescence. On the southwest end of the wetland, there is a pond created by beavers. I headed over there, attempting to follow the inlet creek as it meandered across the meadow. There were lots of Cascade grass-of-Parnassus (Parnassia cirrata) in bloom, but both those and the gentians mostly disappeared as it got boggier closer to the pond. I was hoping to see the aquatics in bloom here, and indeed both floating-leaf pondweed (Potamogeton natans) and small bur-reed (Sparganium natans) were in bloom. Note that both of these aquatic plants have the same specific name, natans, which is latin for ‘floating’. Unfortunately, once I reached the part of the creek where they were still in flower (the water was deeper here), the bank was no longer solid. In fact, some of it seemed to be floating, so I couldn’t get close enough for a clear photo. I decided to cut over to the edge of the woods but was thwarted here again by a section of tall cottongrass (Eriophorum angustifolium). Stepping on it felt like being on a water bed, and I didn’t want to find out what would happen if I put all my weight down, so I was forced to retreat back the way I came until the ground was solid enough to cross. Oddly, when I finally reached the pond, I was able to step out into an area of open water about 6″ deep that was much more stable then I expected. Here I was at last able to safely get good photos of the pondweed and bur-reed. There was also some of the larger narrowleaf burreed (S. angustifolium) in good bloom, and I was able to find some lesser bladderwort (Utricularia minor) I’d remembered seeing here on an earlier visit. After checking out the plant-covered beaver dam, I decided it really was time to head back and hit the road for the long drive home. I was hot and tired but happy nonetheless and looking forward to a return visit earlier in the season.